For Christmas I bought myself something special… a DE (double edge) safety razor and shaving kit. The razor was produced by Merkur and is the heavy-weight, barber-pole style, single blade razor. I had no idea how fulfilling shaving could be! 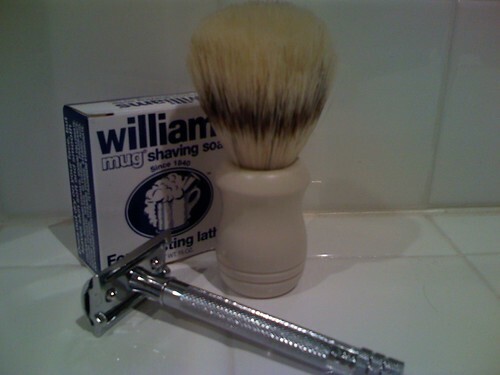 Matched with a badger hair brush and some Williams shaving lather, my shaving experience has changed forever. After only one shave I noticed a dramatic difference. On top of being the cleanest shave I have ever had, I also have zero razor burn and no ingrown hairs! Hard to believe after years of shaving with a Gillette Mach 3 that something can change my life so greatly… I no longer dread getting up ad shaving. I highly recommend switching from your cheap disposable razors and moving to one of these replica beauties. Your face will thank you. The art of shaving has returned for me, and the pain associated with shaving is gone.